With kids in the house, you most likely have the lights on more than you need, are used to the refrigerator staying open for a few minutes at a time and do a lot of other things that are wasting electricity and costing you money. But a few easy changes may help fathers slash their electric bills and teach their kids a valuable lesson. First of all, it’s important to actually unplug small appliances you’re not using, according to TheDollarStretcher.com. This includes everything from toasters and blenders to DVD players and cable boxes. Even though they may be turned off, they are still using electricity if they’re plugged in. Turning your computer and printer off instead of letting them go into "sleep" mode is helpful as well. Cut the power on your power strip for added savings. Turning off the lights when you leave a room seems like an easy thing to do, but kids are notorious for leaving lights on. Make an effort to teach your children about the importance of turning off lights (and other things like televisions!) when they don’t need them on. Switching from regular light bulbs to compact fluorescent light bulbs (CFLs) can help as well. An Energy Star qualified compact fluorescent light bulb will save about $30 over its lifetime and pay for itself in about six months. 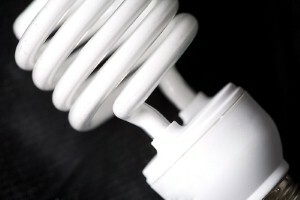 CFLs use 75 percent less energy and last about 10 times longer than regular, incandescent bulbs. According to the U.S. Department of Energy, your appliances and home electronics are responsible for about 20 percent of your energy bills. Some older appliances, especially refrigerators, may be costing you more than they’re worth. Consider switching to more efficient, Energy Star-rated appliances to save money. Experts say energy-efficient appliances actually pay for themselves relatively quickly. You may also be eligible for a rebate when you replace older appliances. Visit the Department of Energy website for information on rebate programs in your state.